Indy 500: An American Icon provides an overview of the tradition and excitement of the great race, and discusses components of the IndyCar racing genre. 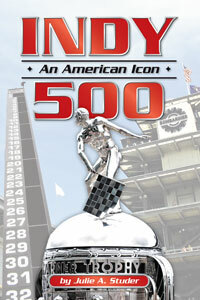 It offers background on the track and traditions of the Indy 500, considers recent IndyCar history and covers multiple perspectives — profiles of select teams, drivers, league administration and racing fans. It looks at cars and equipment, racing costs, how testing / qualification works and factors that influence outcomes (car specifications, driver skill and experience, depth of financial resources, etc.). It captures the fascination, respect and awe that aspiring participants hold for the Indy 500 as the ultimate benchmark by which team, car, and driver performance are measured.